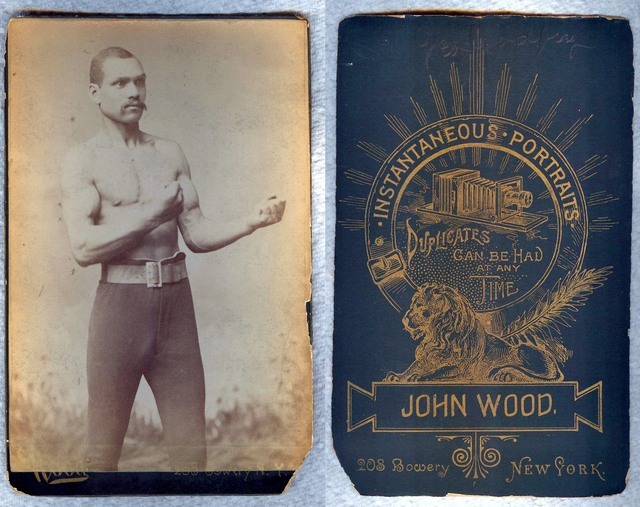 A John Wood cabinet card of Godfrey from the same photo session as the Old Judge card's photo. Cabinet cards were populaly issued in the late 19th and early 20th centuries. They are called “cabinet” card or “premium” card because their size usually exceeds 4” x 6” and were often displayed in curio cabinets. Many were issued to promote various organizations and businesses. Some were even issued by boxers to promote themselves, or sold individually by companies capitalizing on the card collecting craze to sell mass-produced images of celebrities.